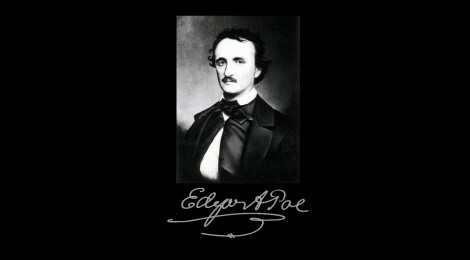 Edgar Allan Poe was an American author and poet. He was born in Boston, Massachusetts. The Raven, one of his more popular works, is a poem noted for its musicality and supernatural elements. The Raven is a tragic, romantic poem, centered on the memory and pain of the narrator’s long lost love, Lenore. It truly does represent and capture the narrator’s intense sorrow, which morphs into frenzy and finally madness. The poem begins with him ‘weak and weary’ at midnight. He was reading books of forgotten lore in a vain attempt to forget his lover. It was late and he was dozing off as he was very sleepy, when suddenly he heard a tapping at his door. He remembers clearly that it was a bleak December night. It was cold and raining heavily. His only company was the dying embers of his fire place which made him feel all the more alone. He eagerly wished for the day to end, hoping that a new day would dull the pain of him losing Lenore. One can identify oneself with what the narrator is going through. Distractions like reading seem to be of some solace to the narrator, who reiterates the pain and sorrow he experiences over the loss of his beloved. The rustling of his purple curtains in the wind and the knocking at his door excited him. He thought for a moment that it might be Lenore, till he calmed himself down and acquainted himself with reality and reasoned that it must be a guest and nothing more. As he moved to the door to answer it he apologized and said that he was sorry that he didn’t come sooner because he was dozing off and didn’t hear the knocking. Oddly enough, once he opened the door, he found no one there. He stared into the darkness, wondering, fearing, doubting and dreaming. Who was it at his door? He whispered Lenore, but no one answered except his echo that said Lenore. This opening of his chamber door is symbolic of him opening the door of his soul, answering the knocking of the memory of his Lenore. He is afraid when he answers as he stares into the abyss; the darkness is overwhelming. He is lost without Lenore. Enraged, he shut the door and went inside when he heard a tapping on his window. He wanted to know who it was and opened the window. Once again, his heart was racing and he tried to calm himself down by saying that it’s nothing but the wind. What is he so afraid of? Is he anxious about Lenore? When he did open the window, in came the Raven, paying no obeisance to him, entering in the manner of a Lord or Lady. It perched above his door, on the bust of Pallas, the Goddess of Wisdom, symbolic of some truth the bird wishes to reveal to the narrator. He was amused by the bird and admitted that watching it, did convert his sorrow, due to him thinking of Lenore, into amusement and fancy, a metamorphosis he welcomed. He described the bird being ebony, not having any feathers on its crown and as having an air of seriousness about it. He personified the Raven and asked for its name, which it replied, “Nevermore”. The narrator was amazed, albeit at the same time, confounded and thought that it was quite irrelevant that the bird said “Nevermore” out of context like that, when he’d asked for its name. Discounting this irrelevance, he marveled at the spectacle of having a Raven named Nevermore in his chamber on the bust. The presence of the Raven began to depress the narrator as he felt that the bird will not be there tomorrow, and will fly away, just like his friends; his hopes and dreams and Lenore, the pain of which he dreads reliving. Strangely enough, as the narrator begins to proceed along this line of thought, the Raven interrupted him by saying, “Nevermore”. Startled by the aptness of the Raven’s reply, which had a patent effect on the narrator, he concluded that the bird might’ve been owned by someone who kept saying “nevermore”, someone who faced an unmerciful disaster or some tragedy, who lived in perpetual melancholy; a parallel he fails to see. He could not fathom any other reason for the bird saying “nevermore”. His interest in the Raven growing, he was quite fascinated by its replies and pulled up a stool and sat on the velvet cushion, just to watch it. He describes the bird as being ‘grim, ungainly, ghastly, gaunt, and ominous’, as he sat and watched it on his stool and pondered over its replies. He made sure the Raven hadn’t the slightest clue of what was going on in his mind, and as he watched it, he felt its gaze burning a hole right through him. This is probably symbolic of what the memory of Lenore was doing to him. He then remembered her and how she will never be able to sit with him on his velvet stool any more. Suddenly, the narrator felt that the air around him was getting denser, like he was being anesthetized by an unseen angel. He is enraged as he believed that the Raven was sent by God to make his memories of Lenore fade. He then called the Raven, “Prophet” and “Thing of Evil” and asked it where it had come from. He demands the Raven to tell him whether the pain of his lost Lenore will ever subside, he unconcerned if the bird was sent by the devil or just managed to get in his chamber by chance due to the rain. The Raven answers, “Nevermore”. Outraged at the Raven’s contemptuous answer, he asked it if he will ever be reunited with a soul in Aidenn, a sweet soul in Aidenn, called Lenore, to which the bird said, “Nevermore”. This infuriated the narrator and was the last straw. He went into a fit of rage and madness. He immediately ordered the bird to get out, back into the storm, to leave the bust of Pallas, and not to leave behind a single feather. He asked the Raven to leave him to wallow in his loneliness. He declared that his ties with the bird have been broken and he asked the bird to take its beak out of his heart. The bird doesn’t flinch. It just sat on the bust and stared at him with gleaming eyes. He then noticed that it had cast a shadow of itself on the floor and the poet says that his soul will forever be trapped in that shadow, a probable self realization of the narrator that his soul will forever be haunted by the memory of Lenore. The poem is an exhilarating ride of emotions both expressed by the narrator and invoked in the reader. The supernatural elements and allusions in the poem ensure that there is never a lull in the readers’ senses as he reads on. It is almost inevitable that the reader sympathizes with the narrator as one reads this tragic, romantic poem.